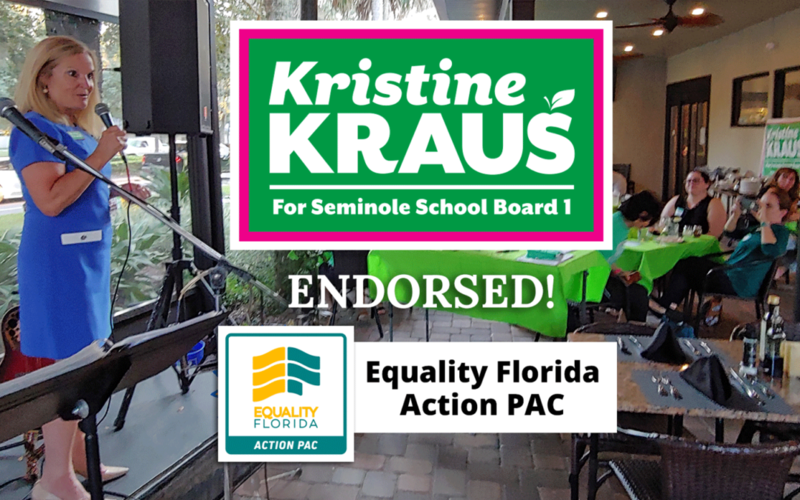 Equality Florida, the state’s largest LGBTQ civil rights organization, has endorsed Kristine Kraus for Seminole County School Board, the first endorsement made by the PAC in the Seminole County School Board race. “As the mother of a gay son who experienced bullying in the classroom, I am running to be an advocate for our children who have not had the protections of a fully-inclusive anti-bullying policy in our district,” says Kraus. Kristine Kraus is committed to making our schools safe, welcoming, and fully-inclusive to all students. Her endorsement by Equality Florida, the first time the civil rights group has made an endorsement for a candidate for SCPS, is a testament to that commitment.